Dig him in "The Outer Limits" episode "The Sixth Finger"
I saw "The Man from U.N .C.L.E." for the first time about half way through its first year. My mom couldn't get me to take off my black turtle neck for 2 weeks. Two years later, my Mother secretly inrolled me in it's fan club, known as "The Inner Circle" and run by a retired General named Mark Whitsett. The package came with several photo's of Robert Vaughn, and David McCallum posing with all of the cool gadgets they had; pistols with barrel extension and shoulder rests, the " Open channel 'D' communicators, which could now be replaced with cell phones, and others that I don't remember. I bought every thing U.N.C.L.E. that I could find. Ironically, just 4 weeks after getting my official fan club membership package, the show was cancelled. I was devastated for months. 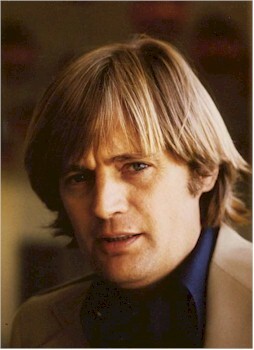 There was also a scene where Kate (I think) asks Gibbs what Ducky looked like when he was younger and Gibbs replied "Ilya Kuryakin". Remember on one particular NCIS show where Ducky went undercover, Ziva asked Gibbs what Ducky's secret spy name was and Gibbs replied "Ilia Kurieyaken". An inside joke by the writers which Ziva didn't get but Tony surely would have.